The old bull is thirsty. And even though snow lies everywhere on the ground, there’s little to drink. But he knows a place where the water collects–a shallow basin on an otherwise gently sloping hillside. He can smell the rot as he approaches the pan. Others of his kind, young and very old, come down to drink and some never make it out of the gumbo that underlies the water. Likewise many of the other four-footed beasts. It’s late summer on the steppe…if you can call freezing night-time temperatures ‘summer.’ The pool is much shrunken after months of drought, and this year’s dead dot the bare earth. A tentative step tells the old bull that the bare ground is firm. His 8 tonnes edge onto the pan toward the remnant pond, shimmering in the raking sunlight. Without warning, the frozen crust gives way. His left front foot sinks to the knee and his bulky torso lurches to the left driving his leg all the way into the cold clay. Every subsequent movement mires him deeper, and soon he’s hopelessly trapped. National Geographic photo of a pan in Zambia during a drought. This helpless elephant was fortunately rescued by game wardens. Most aren’t so lucky. 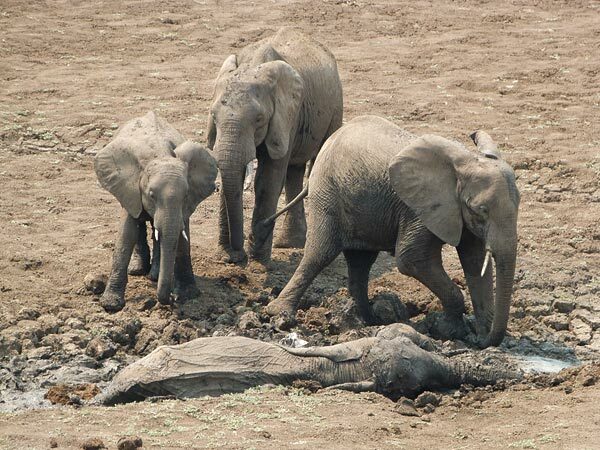 Although the authors mention Gary Haynes’s work on elephants and the fossil record, they evidently missed the bits about elephants getting mired in clay at water holes, and the taphonomic consequences. The description of the excavated sediments are clear evidence that the site was, for quite some time, a low spot that collected water and fine sediments. I’m not sure what ‘scattered soil’ is, but it’s likely that the authors were trying to say something like ‘disturbed sediments.’ I’d expect considerable ‘disturbance’ in such depositional circumstances. Imagine the ‘disturbance’ that could be wrought by an 8 tonne pachyderm in a quagmire full of the carcasses of newly deceased critters, and the skeletal remains of the long dead. 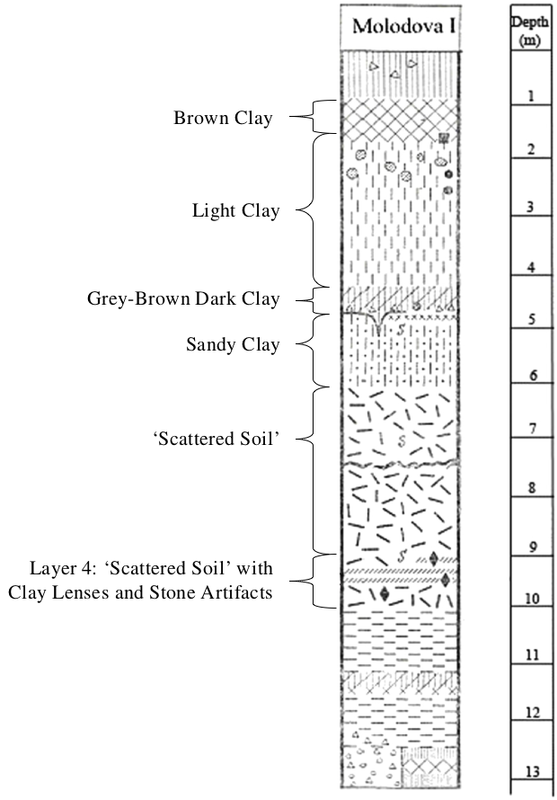 Apparently clay is in abundance throughout the sequence , as shown in the schematic stratigraphic drawing above. Clay collects in basins of water. Clay, when wet, is gooey. And as you’ve seen at the beginning of this post, it’s common for animals, large and small, to come to grief in such geomorphic features. It’s astonishing that the authors wouldn’t have considered the geomorphic context before they settled on hunting as the reason for the animal bone accumulation at this locality. And, if they’d been aware of the true nature of the faunal accumulation they would probably never have suggested that the ‘circular’ area was a structure and not just the natural, expectable result of butchery, in place, of very large, mired animals. I think that probably suffices to explain the faunal and stone artifact accumulations in layer 4 at Moldova I. With regard to the claims made based on bone modification, one can only say that the evidence provided in the paper is less than persuasive. Their Figure 12 presents photographs of modified bone and ivory. All are equivocal, on the evidence, and I’d be very surprised if the authors could produce additional observations that would make these claims more believable. The readership can question my authority in all of these matters. It wouldn’t bother me and it wouldn’t surprise me. However, in the case of the bone modification I’m pretty sure that Gary Haynes and Diane Gifford-Gonzalez will back me up. The two grooves in image ‘a’ could well be stone tool cut marks. They could also be the result of any hard, sharp object grazing the bone in the dynamic context of the water hole. One would need to examine the ‘scar’ itself to see the tell-tale marks of a flake of stone or a biface. The semi-circular modification in ‘b’ might be the result of a hominid trying to enter the diaphysis to extract the marrow. However, this removal lacks the crushing that usually occurs on the diaphysis at the point of percussion, which leads me to conclude that the authors’ claim is more wishful thinking. The image in ‘c’ is so poor that it’s impossible to tell why the authors claim that this is a percussor for stone-tool making. 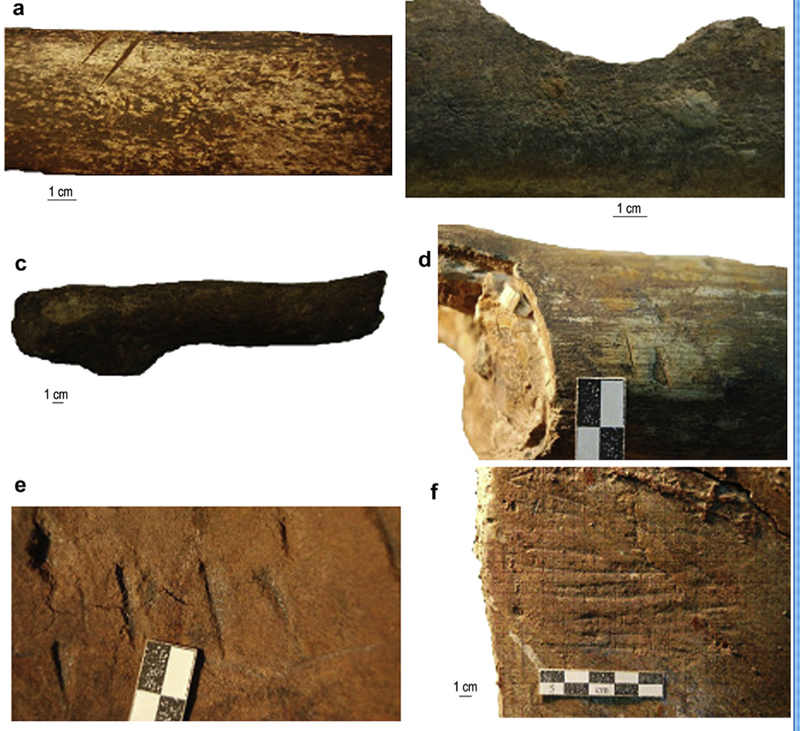 The two sub-parallel fine grooves in ‘d’ might be stone tool cut marks were it not for the bone chip removed alongside the one on the right. This is more than likely a pair of carnivore tooth drags. On the other hand, why would a self-respecting carnivore spend time on a tusk, unless it was the part covered with yummy soft tissue. No help from the authors here. All of the marks in ‘e’ are as likely as not carnivore tooth mark. They look nothing like stone tool cut marks. Finally, the fine, parallel striations in ‘f’ are classic trampling damage. At this scale it could well have been the foot of an 8 tonne elephant. That it occurs on a relatively plane portion of a flat bone makes it even more likely that these are scuff marks and not butchery marks. I think I can wind it up for now. If anyone wishes to refute the empirical claims that I’ve made in this post, please feel free. However, I think we can safely forget that this paper was ever published, and get back to contributing to knowledge with well-reasoned inferences from the archaeological record, like good scientists. This entry was posted in Neanderthals, taphonomy. Bookmark the permalink.